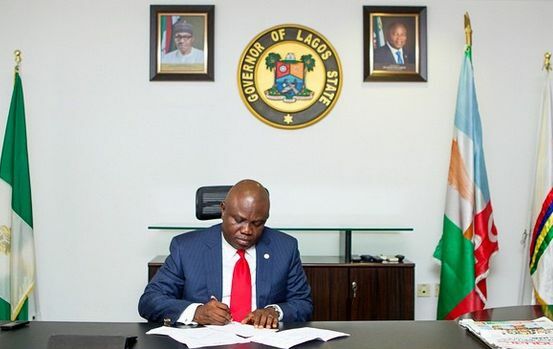 Governor Akinwunmi Ambode has denounced the practice whereby 50 percent of Value Added Tax (VAT) generated monthly by Lagos State is being shared to other states of the federation. This was as he declared that the state was in support of the national leader of the APC, Bola Tinubu, on his demand for devolution of power and the need to entrench true federalism in the country. Governor Ambode disclosed this at the 2017 fourth quarter town hall meeting, the ninth in the series, held at the SUBEB proposed a permanent site in Kosofe Local Government Area of the state. He said, “We enact a law and somebody says he wants to do another law that regulates hotels inside Lagos. Is it not because of the roads that they put a hotel there? That is what devolution of power is saying. If these things are on the residual list, let local governments and states deal with them. That is all that we are asking for. “It’s not that we will generate VAT here and somebody will be sharing 50 percent of the VAT somewhere else. “So, obviously that is the whole idea behind this agitation for true federalism, devolution of power and the need to use it to liberate ourselves so that we can get more prosperous; so that our people can be more comfortable and it is all about the welfare of our people. Governor Ambode maintained his position while responding to a question raised by a resident on calls for true federalism, saying he was in support of it. The governor insisted that it was time issues relating to devolution of power were addressed, adding that it was the only way more resources could be made available to states for needed infrastructure. He wondered why federal government should be insisting it is in charge of inland waterways in Lagos.